What is the apostolic ministry of a deacon, priest and bishop? The meaning, therefore, of the Sacrament of Holy Orders, is the placing of a man into the order through which he receives the gift of the Holy Spirit, permitting him to exercise sacred power, which flows only from Christ through his Church. This happens through apostolic succession in the imposition of hands by one or more bishops within the Catholic faith. There are three degrees of ordination: deacon, priest and bishop. Through this ordained ministry, a man “acts in the person of Christ,” meaning that in the Catholic sacraments, Christ himself is present to His Church through the ordained minister. The ministry of Christ, passed down through the Apostles, makes Christ truly present through the seven sacraments in Catholic churches all over the world — in every age. Ordained ministers in the Eastern Church — the Eastern Orthodox — also possess the fullness of this sacrament, and can therefore validly administer the sacraments proper to their office/ministry. But one might ask, “Where does Jesus establish the priesthood as an office to be handed on to men, through succession, as is the norm in Roman Catholicism?” Well there are several places where this can be directly and indirectly inferred from Scripture. St. John tells us about Jesus giving the Apostles the power to forgive sins when, he appeared to the Apostles after his resurrection. This shows that Jesus gave his authority and power to forgive sins – as the eternal high priest – to a select group of individuals in order to exercise that power and authority on Earth. We see evidence of deacons and priests being ordained and carrying on the ministry of Jesus as agents of the Apostles throughout the New Testament. In 1 Timothy 4:14 and 5:22, we see men being ordained for priestly service by the laying on of hands, and then carrying out that ministry in James 5:13-15. We also see in Acts 6:1-6 that the Apostles ordain, by the laying on of hands, seven men to tend to the service of the Christian community in a lesser degree than the Apostles and Presbyters (priests). These deacons are then later referred to in several additional passages of the New Testament, including Philippians 1:1, and 1 Timothy 3:8. If you would like, you can find more biblical references to the priesthood and diaconate here. The Catechism of the Catholic Church is a gathering of Sacred Tradition intended to communicate to the faithful all that they must believe — according to their baptismal promises — that the Roman Catholic Church teaches. So, what does it tell us about Holy Orders? Paragraphs 1536-1600 of the Catechism deal exclusively with the three degrees of Holy Orders. An interesting point to pull out of this section is 1546-1547, where the common priesthood of all the faithful is discussed. Scripture speaks of a hierarchical priesthood, as well as the priesthood of all believers, who are called to live as priestly people through lives of faith, hope and charity. All Christians acknowledge this universal call to be a priestly people, yet it is often confused with the hierarchical priesthood, outside of apostolic faith traditions. 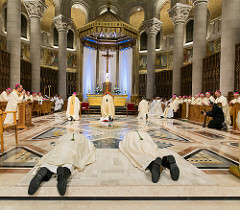 However, the prayer below, said at the priestly ordination, highlights the typological connection mentioned above that runs through Melchizedek, the priesthood of Aaron, the Levitical priesthood, the priesthood of Christ, to the Apostolic priesthood established by Christ to serve his Church. It’s also important to note where the Catechism speaks to celibacy in the priesthood. The celibate life runs very much contrary to our current culture, and as a result of this, celibacy comes up very frequently in conversations with non-Catholics about the priesthood. It’s important to note that a vow of celibacy is voluntary. Christians are not required to be celibate for life. 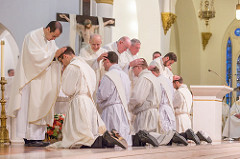 The Latin rite, however, selects candidates for the priesthood from those who have made a voluntary vow of celibacy for the sake of the kingdom of heaven. So, although married clergy is common, the preferred state of both bishop and priest in the eastern rites is still celibacy. And only celibate priests are selected for the fullness of the sacrament — the episcopate (bishops). In addition, married clergy from Protestant denominations who convert to Roman Catholicism can retain their status as married clergy. This is actually quite common among converts from Anglican Churches and Orthodox Churches. Christ, the head of the Church, established the Sacrament of Holy Orders with the episcopacy of the Apostles. The early successors of the Apostles, who received the sacrament directly from them through the laying on of hands and the prayer of consecration, became some of the first bishops of the Church. These men and many who followed them — along with some early theologians — are often referred to as the church fathers. Many holy priests and deacons are engaged actively in the ministry of the Church, but the college of bishops have particular authority in the governance of the Church and in protecting the deposit of faith left by Jesus Christ. The Roman pontifical office, the “Chair of St. Peter,” — currently filled by Pope Francis — passed along with it the unique authority established by Jesus in Scripture. One of the ways in which a pope expresses this authority is through the calling of ecumenical councils, which provided opportunities for Church fathers like St. Augustine to contribute intellectually to the theological development of the Church. The pope is also free to make decisions on his own for the Church. St. Gregory the Great was the first pope to use the phrase “ex cathedra,” meaning what was being said was directly from the Chair of St. Peter. What are the seven sacraments, and who performs them? There are seven sacraments in the Catholic Church. These are the seven times in our lives when a man in the office of bishop, the ministerial priesthood, or the diaconate, acts in the person of Christ to bless the people of God with an outpouring of the Holy Spirit. The Sacrament of Baptism — in addition to forgiving sins — brings the faithful into an initial relationship with God. This sacrament of initiation may be administered by all three degrees of the clergy, including deacons. 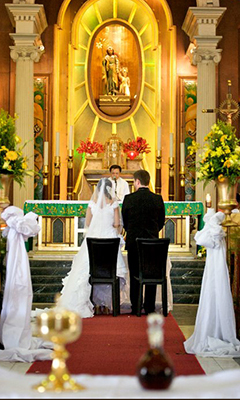 Deacons may also perform the marriage rite upon the permission of their pastor. With the exception of the Sacrament of Holy Orders, ordained priests may perform any of the sacraments, although the Sacrament of Confirmation is ordinarily administered by bishops, while priests will typically administer the sacrament on adult converts at the Easter Vigil. The graces of the Holy Spirit received in the sacraments are a special grace. Most Christians are familiar with the concept of grace as an outpouring of the Holy Spirit with blessings and good will from God. However, in the Catholic faith, sacramental grace is something entirely different. Through the ministry of the Catholic Sacrament of Holy Orders, the sacred power of God’s very life descends upon and dwells within those receiving the sacraments. This is especially true for Holy Communion, during the sacrifice of the Mass, when we consume the body, blood, soul and divinity of Jesus Christ. Particular churches and rites may have different practices, but Catholic churches around the world all have the same seven sacraments. Marriage and Holy Orders are the two sacraments that mark the beginning of a new way for the people of God to relate to God. These are the vocational sacraments. For deacons, priests and bishops, the beginning of their vocation means a completely different way of life. We’ll discuss that more in the next paragraph. Marriage is also a completely different way of life as two become one, beginning a family. Family life weaves in and out of ordained life. The most obvious connection between the vocation of marriage and a vocation to the priesthood, is that throughout the course of married life ordained ministers are present, providing access to the sanctifying grace available through the sacraments. Matrimony, the sacrament of Baptism, Holy Communion, Confession, Anointing of the Sick and funeral Masses, are all ways in which the lay faithful receive sacramental grace through the ministry of a permanent deacon, a priest, or a bishop. The priesthood also supports the domestic Church by providing family resources that may take the form of a faith formation class, a bible study, praying the rosary, or even something as simple as a prayer card to help families learn about the saint of the day, holy days of obligation or catholic prayers. To offer an example of this type of resource from a Catholic bishop, our Archbishop of Portland in Oregon, Most Rev. 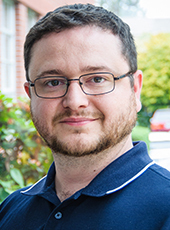 Alexander K. Sample has asked that all parishes begin reciting the St. Michael prayer for protection from evil during this time of scandal in the Church. He provided a prayer card to guide the faithful in that practice. A bishop, priest and deacon each have a unique sacramental character that colors the consecrated life or religious life. Baptism and Confirmation carry a sacramental character as well, which seals the receiver of the sacrament and consecrates them for a specific purpose within God’s plan. This is why a priest is “a priest forever,” whereas in heaven we are “neither married nor given in marriage.” So, in the case of those who are married in the permanent diaconate, their vocation as a permanent deacon carries on into heaven, but their vocation to the married life ends at the death of one of the spouses. The Church speaks about this as an “ontological change,” meaning that the change in one receiving Holy Orders is a change to the very nature of their being. This article from the Vatican speaks to this change that occurs when “Sacred Power” is conferred upon the ordained. Pope Benedict XVI articulated beautifully what it means to live out one’s vocation to Holy Orders in light of this ontological change. He encouraged priests to identify themselves personally with the mission of Christ and to abandon the whole person to the will of God. Because the effect of the Sacrament of Holy Orders is a permanent and lasting change on the recipient, deacons, priests and bishops are free to live in a way that many of the rest of us are not. Free from many of the cares of this life, priests and bishops are especially free to dedicate the energy they would otherwise spend on family life to their spiritual well-being and the spiritual well-being of their congregations. Their vocation also carries with it some distinct responsibilities and limitations, which are spelled out quite well in canon law. Priests and bishops are directed to pray the liturgy of the hours, either privately or communally, but most Catholics don’t experience this type of prayer often, or ever. A special time to experience this prayer would be during the Advent season when the “O Antiphons” are prayed, but even during ordinary time, the faithful can participate in this type of prayer. Many parishes offer a service for morning and/or evening prayer (Matins & Vespers). This is a beautiful way to participate with your priest in the daily observance of their vocational duties. In many ways, the songs appropriate for Confirmation are also appropriate for ordination. Much of the same imagery speaks to both sacraments; descent of the Holy Spirit, a call to discipleship, a sending forth, etc. It’s sometimes difficult though to find music that speaks particularly to ordination. With the exception of a song to celebrate a parish priest’s anniversary of ordination, most communities don’t have a liturgical need for anything this specific. The majority of ordinations are also unlikely to incorporate more contemporary songs into the celebration. Nevertheless, there is still some great music out there which speaks to living out a vocation to ordained ministry. Here are three great songs for listening and/or incorporating into vocations talks or retreats. One thing I love about “May You Be Known,” is that Sarah included alternative text to be used for diaconal ordinations. So, it’s versatile in that regard. But it’s also in a style that bridges the gap between liturgical music and something that the average person would listen to in their car. I’m confident that this song will find itself as a staple in ordination liturgies. Tom’s “I Will Choose Christ” calls us to lives of service and to pour ourselves out at the foot of the cross. The song encourages us to learn from the Lord’s suffering and to walk that road of suffering with him. It speaks to the giving of one’s self completely in sacrifice to the work of the Lord and his will. As we are all called in the universal priesthood, so our priests and deacons are called to “Go Out, Go Out” and spread the Good News to all the world.